‘Lucrative salary’ is what everyone is looking for while looking for jobs in Philippines. Salary is a major attraction and deciding factor in the career path. There are a number of career paths that actually provide good-paying jobs. 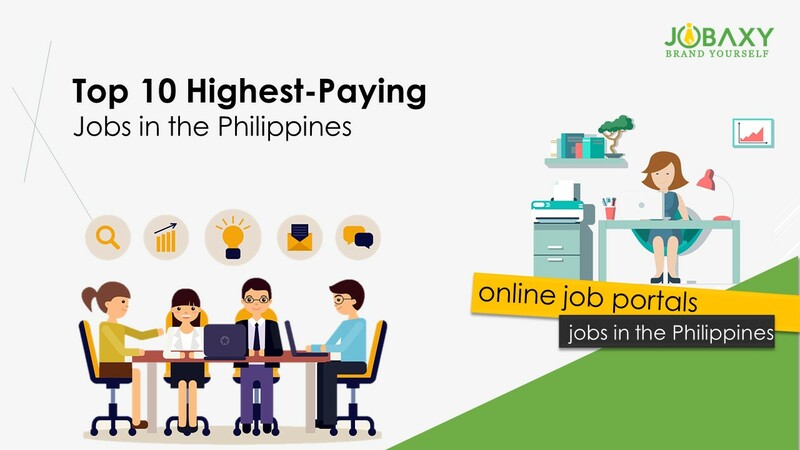 Listed here are the top 10 highest-paying jobs in the Philippines. The corporate sector is currently enjoying number 1 spot in the highest paying jobs in the Philippines. Corporate strategy jobs require expertise in development, coordination, enterprise strategic projects, planning, strategic intelligence, knowledge management and creativity for successful business planning. IT sector has always been rewarding. IT-related jobs are number rank high for both fresh graduates and senior management levels. Jobs in the IT field include software developer, web developer, and systems administrator. This field is particularly for the people who love numbers. Math magic can earn you handsome rewards. Jobs in this category include banking jobs, jobs in insurance companies and investment firms. Actuaries have the 2nd highest salary for beginners and 3rd after earning enough working experience. Quality assurance and quality control is an important and integral part of the service industry. Assuring best quality of your product or service is crucial to its success. The tasks under QA and QC (as it is mostly referred) require to be done meticulously. This career path is for individuals are responsible, self-driven and have an eye for minute details. Philippines economy boasts on BPO industry. BPO industry has a major share in the newly industrialized Philippines. There are many schools to train in the proficient in the English language. Filipinos are polite and possess tremendous patience while dealing with irritated customers over the phone. Those interested in interacting with people and talking, these are perfect jobs for you. Training and development officers are required to upgrade the skills and knowledge of the employees to accomplish the task. This job is for those who have enough patience and the urge to impart knowledge to others. Public relations refer to the practice of enhancing an organization’s reputation in the eyes of the general public, employees, clients, and stakeholders. Public relations experts are specially hired to maintain the brand image of the organizations. Financial analyst, certified public accountants (CPAs), loan officers and bank tellers are the jobs that feature in this category. Finance experts require a sound knowledge of accountancy and mathematics to properly handle the accounts and payments. If you are interested in numbers, the finance industry is for you. Human Resources or HR’s aim is to achieve the goal of the company. HR job profile includes human resource management, benefits and safety of the employees, and last but not the least recruitment. Law grads to have a rewarding career. You can apply as a legal assistant, paralegal, contract management administrator or as a junior lawyer. Fresh grads can expect a salary of P 20,000 while the experienced attorneys expect somethinging as high as P 67, 402. For fresh grads apart from the above sectors healthcare, and advertising and media are also good options. Both these sectors rank in the top 10 when it comes to jobs for fresh graduates.